When you understand how the mind works, you can think smarter and act smarter. 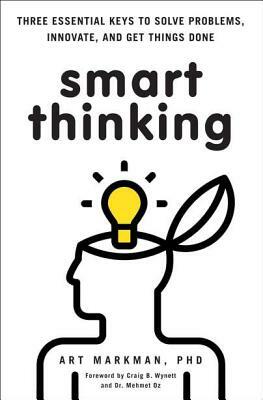 Based on the precepts of cognitive science and drawing on a half century of interdisciplinary studies, Smart Thinking is the first book to reveal a three-part formula that distinguishes Smart Thinking from innate intelligence and shows how memory works, how to learn effectively, and how to use knowledge when you need to get things done. Beginning with defining the difference between Smart Thinking and innate or raw intelligence, cognitive psychologist Art Markman demonstrates how it is possible to learn Smart Thinking that you can apply to the real world. Drawing on multiple research disciplines, including psychology, artificial intelligence, philosophy, neuroscience, learning sciences, linguistics, anthropology, sociology, and education, Markman provides insights into the functioning of the mind and synthesizes this understanding into practical tools and exercises that develop new skills and achieve personal goals. The book culminates in tips for creating a Culture of Smart to make everyone in an organization more effective. Art Markman, PhD is on the faculty member of the University of Texas since 1998 where he is the Annabel Irion Worsham Centennial Professor of Psychology and Marketing. He has published more than 150 scientific papers in the area of cognitive science. He has been the editor of Cognitive Science since 2006. As a consultant, Dr. Markman has worked with industry, including Proctor and Gamble, and partnered with Drs. Mehmet Oz and Michael Roizen on two of their bestselling You books. He is a member of the scientific advisory board for the Dr. Phil Show and is a regular online contributor for Psychology Today, the Huffington Post, and the Harvard Business Review.